Christiana was born and raised on the island of Maui. 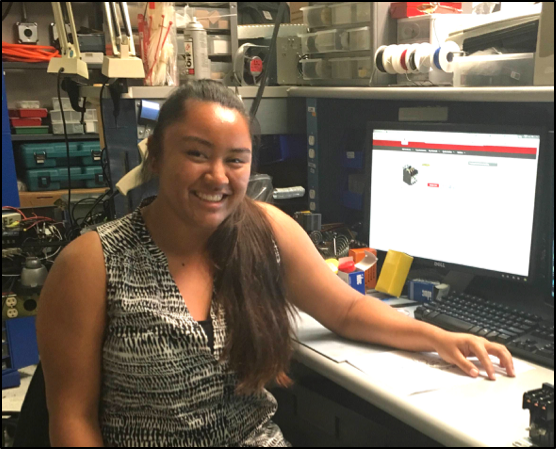 After graduating from Baldwin High School, she went on to pursue a Bachelor of Science degree in mechanical engineering at the University of Hawai‘i at M?noa. She became interested in cars during high school and by learning more about and gaining experience working on them, her career goal became to work for the automotive industry and help improve its environmental impact. Eventually, she would like to live in Europe and continue working in automotive design there. In her spare time, Christiana enjoys studying foreign languages, going to the beach and playing music. The Subaru Telescope utilizes many different types of instruments and as a result, has a power supply that is nearing capacity. In order to maintain the functionality and efficiency of the site and instruments, a means of testing different power qualities, such as voltages and currents, is necessary. Data from this testing can then be used to make improvements to electricity distributions. To accomplish this, an interface box was built that connects between the instrument power distribution unit (PDU) and the power source. This interface box will be used to safely take measurements instead of opening up the circuit breaker panels, which is the current method of testing and requires the presence of a licensed electrician. The box was designed to be easily handled, carried during use, and easily replicated. Safety features were also added for emergencies, such as an emergency power off button and the ability to shut off if used under the wrong conditions. A SolidWorks model was constructed in order to make sure all the components fit properly and an electrical schematic was drawn. After these models were finalized, the chosen parts were ordered, assembled, and tested with a test PDU in the lab. After final testing, the box was taken to the summit to obtain the data to make adjustments. In the future, this box can be designed and implemented into new instruments so that data can be taken without the need to utilize an external interface.